Happy New Comic Day! Another lovely week of comics for us. So let's flood our shops and buy some good books. I won't lie, there aren't that many cool covers out this week. Once again we celebrate the eternal battle between two awesome fictional forces. 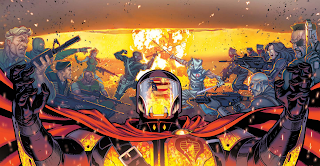 Check out the variant for Snake Eyes #11. Yo Joe! The credit for this one is rather tricky. Several sources give due to different artists, David Williams and Kelsey Shannon. I don't know either of their work to be able to visually differentiate between the two. If anyone knows for sure, let me know, and I'll correct it. The G.I. Joe books have taken home several CotW awards. It's not totally my Yo Joe bias, it just happens that they have nice covers. The image above is actually three covers formed to make one image. 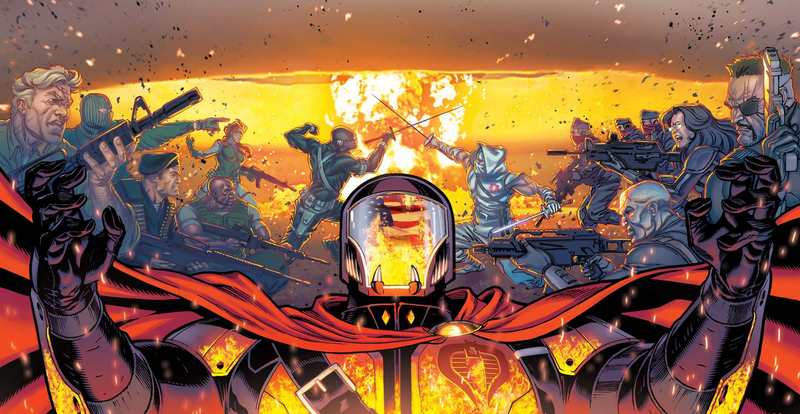 So for this week, focus solely on the middle section which features Cobra Commander's giant metal head in front of dueling sword-brothers Snake Eyes and Storm Shadow. In the reflection on chrome dome's faceplate, you'll notice the burning American flag. That's some imagery right there. I love G.I. Joe. Now you know. And knowing is...well you know the rest. Thanks for looking.